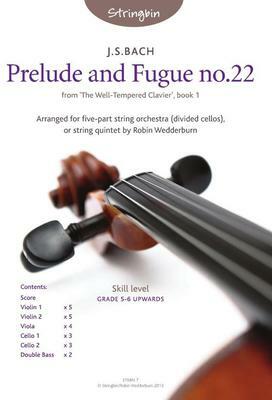 One of the only two five-part fugues in the W-T C (both of which are among the finest of all), with an especially beautiful prelude, this magnificent piece is arranged here, transposed from B flat minor into G minor, for five-part string orchestra (two cello parts), plus double bass (not indispensable although desirable), or string quintet (Schubert combination), or sextet (quintet plus bass). Duration: a little under 5 minutes. What do you want to know about Prelude and Fugue no.22, BWV 867 (WTC book 1)?